Prospective Leeds United owner Massimo Cellino has sacked the 36th manager in his 22-year reign at Italian club Cagliari. Cellino, who has won his appeal to takeover the English Championship club, fired Diego Lopez on Sunday. Cagliari are seven points clear of the Serie A relegation zone after a 3-1 home defeat by second-placed Roma. "This decision is extremely painful as Lopez has always presented himself as a professional man, " the club said. "But the change was necessary to give this team better direction until the end of the season, in order to meet the objective of survival." 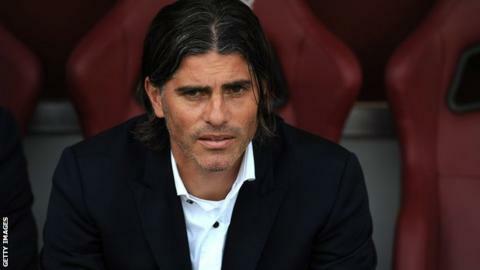 Under 39-year-old former captain Lopez, Cagliari have lost four of the their last five Serie A matches, winning just three in 15 since early December. The ex-Uruguay defender, who was promoted from assistant coach at the start of the season, spent 12 years playing for the Sardinia club, making almost 350 league appearances before retiring in 2010. Italian businessman Cellino, 57, is set to complete his takeover of Leeds after an independent QC overturned the Football League's decision to block the move. He still owns Cagliari but is reported to be trying to sell the club.